The UK's vote to leave the European Union has sent tremors throughout global financial markets. But keep in mind that the vote was not binding, and nothing has happened so far; it will likely take a year or so for the UK to hammer out new trade agreements, if indeed it does exit the EU. The UK is a huge net importer of goods, so the great majority of its trading partners will be loathe to lose access to its market. It's conceivable that the UK could eventually end up with better trade deals than it has currently. The EU made free trade deals with the US difficult, for example, so an independent UK might benefit from better US ties. But anyway, who wants trade to grind to a halt? That's one of the great things about the age of globalization: the more trade there is among nations, the more incentive everyone has to coexist peacefully and prosperously. Trade barriers and tariffs exist only to protect favored interests; in an ideal world, all trade would be free, just as capital should be free to go wherever it wants. If the UK comes out of this stronger, other nations will follow (competition is a wonderful thing). In fact, that's one of the very good things that could come of a Brexit: shaking off the Eurosclerosis that has held back growth in the Eurozone for many years. For example: once unencumbered by EU regulations, the UK could convince Apple to relocate to London under favorable tax terms that wouldn't be subject to EU rejection. 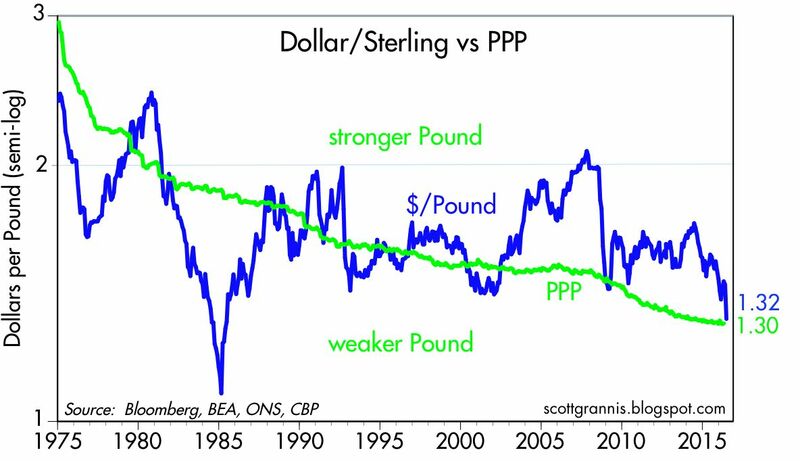 Plus, with the pound so much cheaper, investment in the UK suddenly looks more attractive on the margin. Unfortunately, we don't live in an ideal world. Global trade and prosperity are far from being maximized, thanks to politicians and special interests. The real issue surrounding Brexit is whether the gradual breakdown of the EU (others are sure to follow, especially if the UK comes out a winner) will result in trade that is freer or less free. We won't know the answer to that question for years, of course, but I suspect that competition among nations will drive better and freer trade relations, and that would be very good for growth from a long-term perspective. In the meantime, life and trade goes on and the latter is quite unlikely to grind to halt or even slow down, for the next several months. Meanwhile, the world's productive assets are trading at a 5-10% discount all of a sudden. 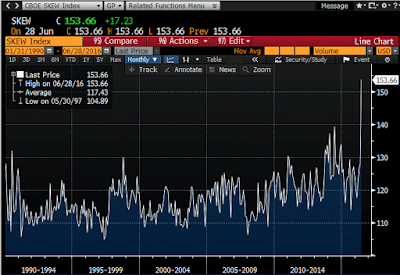 Absent some clear indication that global commerce is truly at risk, it will be hard for this discount to deepen much further or persist for long, especially when cash still yields almost zero. 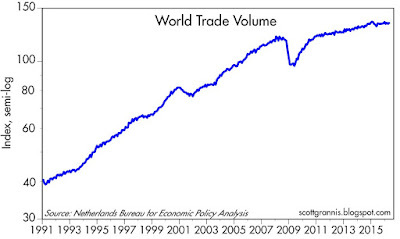 To begin with, I note that the volume of world trade, shown in the chart above, has more than tripled in the past 25 years, rising at an annualized rate of 5% from 1991 through last April. 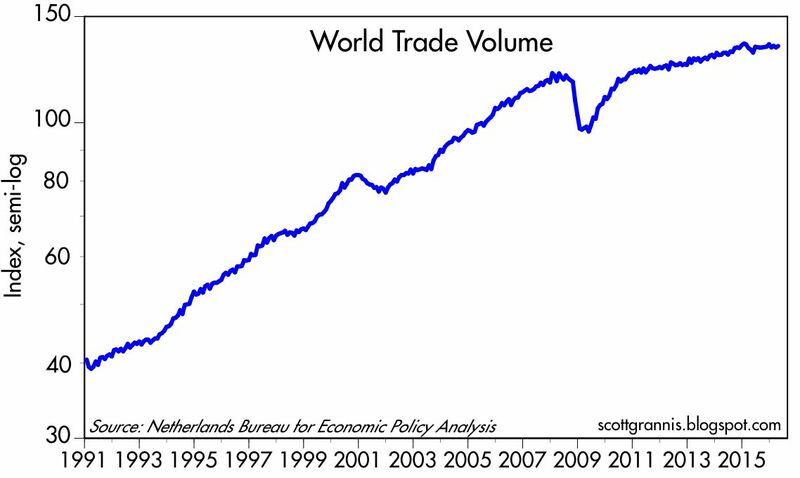 But the expansion of global trade has slowed down significantly since 2008, and it is up only 1.4% in the past year. I'd put some of the blame for the slowdown on trade barriers and eurosclerosis. The US has suffered from slow growth over the past decade or so, but the Eurozone has suffered much more; no wonder there's so much popular discontent. In the past month, since the likelihood of a Brexit began to rise, the pound has lost about 10% of its value relative to the dollar and 9% relative to the Euro. 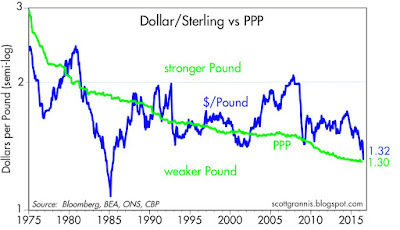 Two years ago, at 1.70 to the dollar, the pound was expensive on a PPP basis. Now it's trading around fair value, according to my calculations. This ought to be enough to awaken interest in UK investments. 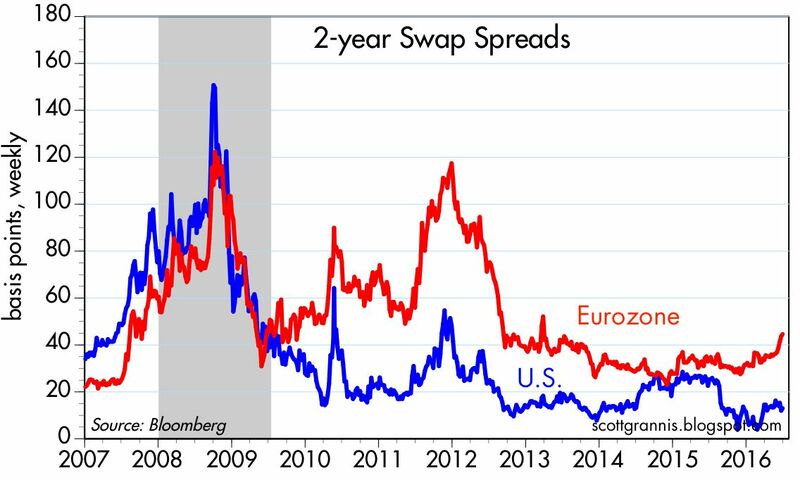 2-yr swap spreads are still relatively low, which suggests that liquidity is plentiful and systemic risk is relatively low. 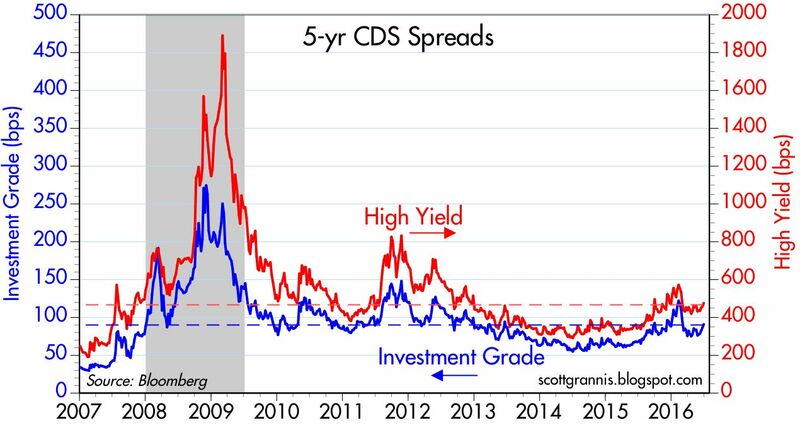 Spreads are quite a bit higher in the Eurozone than in the US, however, which is not surprising given all the concern over there. 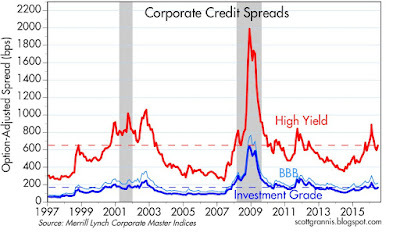 But spreads are much lower today than they were at the height of the PIIGS crisis back in 2011. The Eurozone is not on the verge of collapse, and no one is talking about abandoning the Euro. Having plunged to 1.44% today, 10-yr Treasury yields are about as low, on a closing basis, as they have ever been (the all-time closing low was 1.39% in late July 2012). It's almost as if the world has lost all hope of ever enjoying decent growth or rising inflation again. 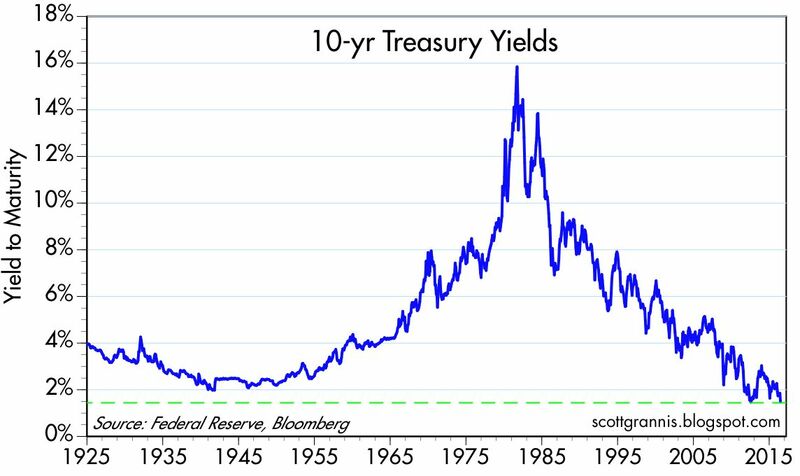 Treasury yields are abysmally low not because the Fed is driving rates down artificially; rates are low because the market despairs of ever seeing stronger growth, meanwhile continuing to worry about slow growth devolving into deflation. This is one of the best barometers of pessimism that I know. Meanwhile, 10-yr government yields are -0.12% in Germany and -0.19% in Japan—both at all-time record lows. 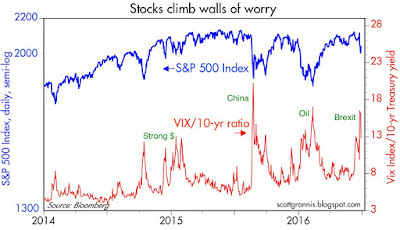 Abandon all hope, yee who live in the modern world today, the market seems to be saying. Pessimism is the order of the day. 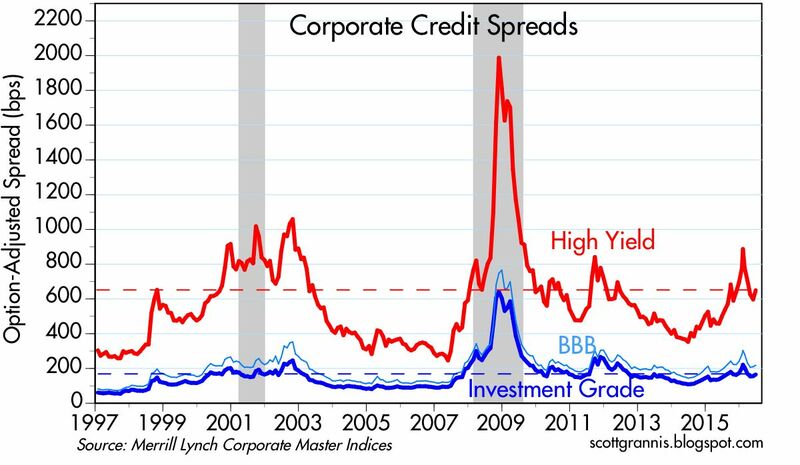 Credit spreads have ticked up of late, but they are still far below levels that we would expect to see in a crisis. 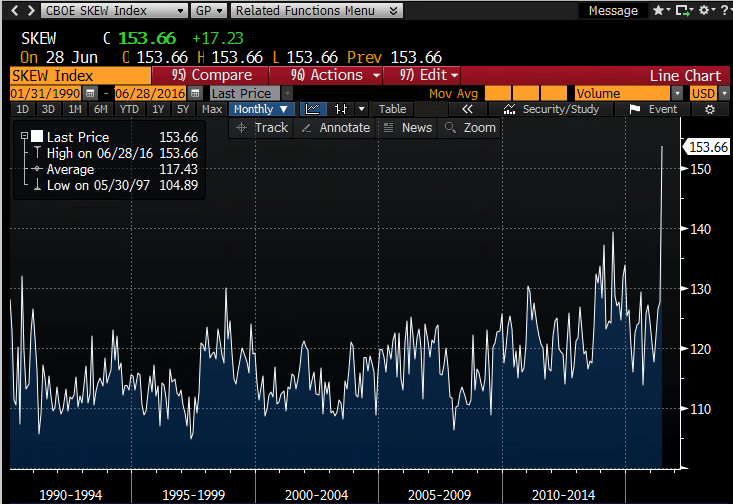 Not surprisingly, the Brexit Panic has boosted the prices of the world's classic hedges against uncertainty: gold and TIPS. But we seen worse, as the chart above shows. 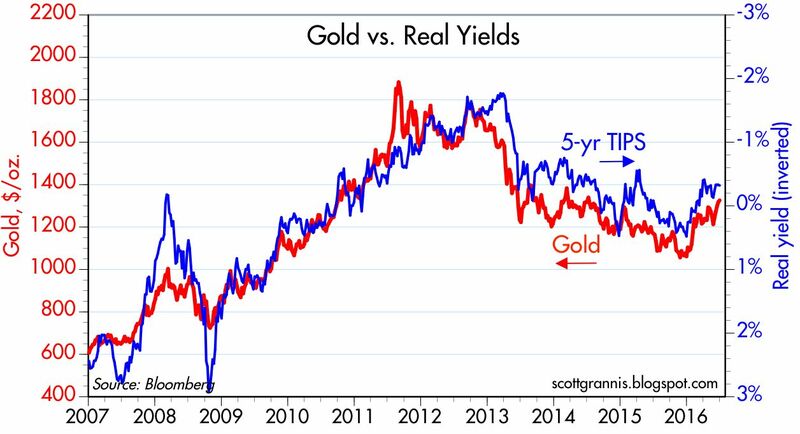 Gold is up 25% so far this year, and it's up 10% in just the past month, but it is still down 30% from its 2011 high. Similarly, TIPS prices today (as proxied by the inverse of their real yield in the chart above) are up this year, but still much less than they were at their peak in 2012. Investors are crowding the exits, but we've survived worse. 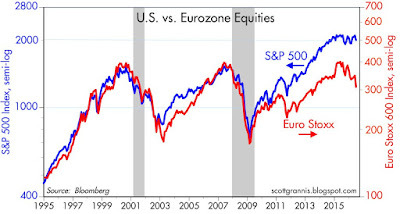 The chart above compares the S&P 500 to its Eurozone counterpart. Using these two indices as representative of stocks in the US and in the Eurozone, US stocks have outperformed Eurozone stocks by a whopping 55% over the past six years. What's bad for the Eurozone has not been bad at all for the US. The world's two economic powerhouses are no longer moving in lockstep. All the more reason for the UK to abandon the leaky EU ship. We may well see more pain and suffering as investors worry about all the unknowns that lie down the road over the next few years. But the end result doesn't have to be bad at all, and it could in fact be very positive. The UK has just opened the door to competition in Europe, and competition almost always results in things getting better. Only politicians and bureaucrats think otherwise. UPDATE (6/29, 13:30 PT): Stocks had yet another bounce today. The Vix fell from 18.8 to 16.6, but the 10-yr Treasury yield only rose 4 bps, ending at a very low 1.51%. 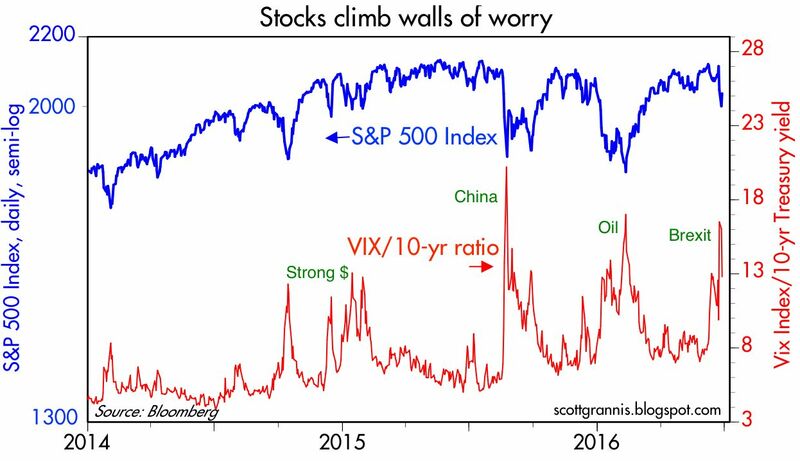 So the market is getting over its fear, but has yet to regain any confidence in the outlook for growth. 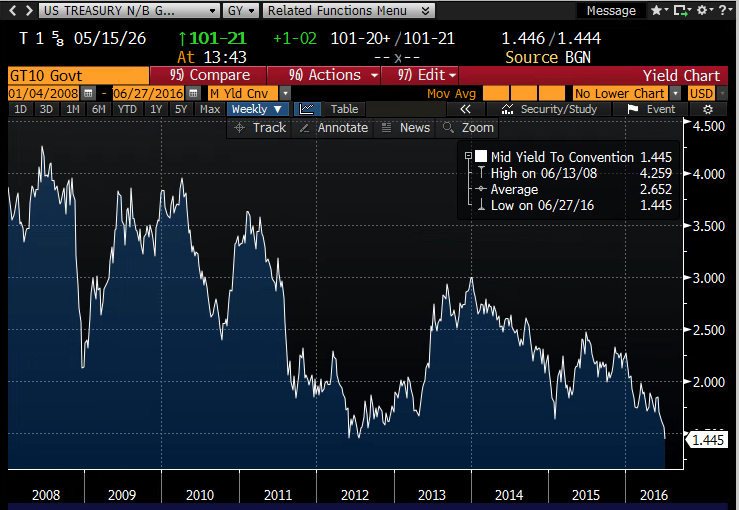 The bond market doesn't see any meaningful chance of an increase in short-term interest rates until some time next year. 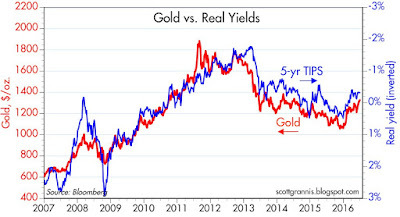 Near-term inflation expectations remain low, at 1.4%, but gold prices rose to a 2-yr high of $1319/oz. UPDATE (7/1, 2:30 pm): Equities have almost completely recovered the losses they sustained following last week's Brexit vote. The Vix index has declined significantly, but 10-yr Treasury yields remain at all-time lows. What this means: the market is not very nervous anymore, but optimism regarding the future is in very short supply. "just as capital should be free to go wherever it wants. " - how come this doesn't apply to labor? Why can't labor be also free to go wherever it wants to go? Do you support free and unrestrained immigration, aka, open boarders as well??? In an ideal world, yes, labor and capital should be able to go anywhere. Unfortunately that ideal world is tough to find. 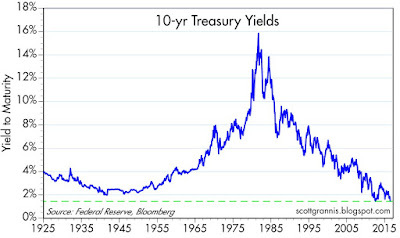 My usual Milton Friedman-inspired caveat: interest rates are low due to tight money. From this point, there is no way for central banks to raise rates. 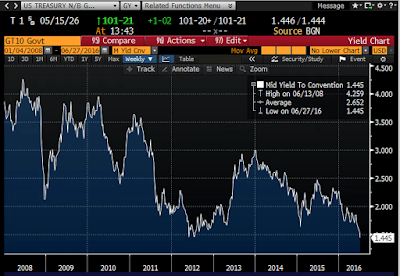 Any tightening of central bank policies will only lower even further the 10-year yields. And remember a central bank can effectively tighten, even while standing still. What is needed is a unified central bank platform of extensive quantitative easing until we see growth and inflation north of 3% throughout the developed world. After several years of that, decide to do next. Maybe shoot for 4% real growth. Plenty of capacity out there. That so called ideal world doesn't exist because the capitalists will ensure labor cannot go anywhere it wants to go. How else can these capitalist extract the most profit, other than by suppressing the labor component of production. Netbacker: I think you have it exactly wrong. If more labor wants to go to country A it's because wages are attractively high. More labor supply in country A will tend to suppress wages. And lower wages will work to capital's favor. The best way to think about labor and capital: when capital is abundant labor tends to be in short supply and wages tend to rise. Think Switzerland. When capital is scarce, labor tends to be abundant and wages tend to fall. Think Venezuela. The objective of fiscal policy should be to make a country very attractive to capital. That way production and living standards will rise. Shortages of labor are not attractive to capitalists. Another good post. 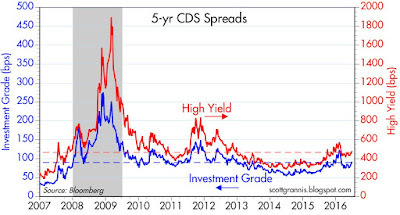 For the charts, what CDS and swap spread indexes are shown? Thanks! The charts show generic 5-yr Credit Default Swap Spreads and 2-yr Swap Spreads. The impact of short term disruptions on people should not be ignored even if in the long term it would benefit all. Trump and Sanders are the result as is Brexit.
" If more labor wants to go to country A it's because wages are attractively high. More labor supply in country A will tend to suppress wages. And lower wages will work to capital's favor. " Yes, in theory, in practice this would not happen as long as human beings vote and don't live for a 1000 years. The voters would change the governing individuals or the system itself. Recently a certain well known individual said a decent example for this which was spot on: a coming certain disruption in the next few years will be self-driving trucks. It will impact millions, countless drivers would lose their jobs, whole small towns who catered to the drivers would be shut down. So, yes, the net economic impact might be indeed positive in the long term, for whole of society, but in the short term these people will vote Sanders/Trump. This is what people do when they feel powerless. The economic and political elite has ignored this reality for many years now, resulting in the current mess. Just shouting "free free free" is as stupid as shouting "communism communism communism"!. Somewhere in there there are people, not robots and we all think and behave in a certain way and act on the same incentives. Roy: The adverse impact on certain sectors of the economy as a result of free trade and immigrant inflows is not something to be dismissed, as you note. But the solution is not obvious. To try to "fix" this problem is equivalent to banning competition, which is always a factor. I don't have an easy solution, but it strikes me that trying to avoid the pain by limiting imports and immigration is not the best solution, nor does it make sense to hand out subsidies and re-training benefits. I'll put my trust in the market, which has proven to find solutions to these problems for hundreds of years. But to ensure the market has room to accommodate the dislocations from free trade, etc., I think it's important to minimize the government's influence on the economy: keep taxes and regulations as low as possible. Let the private sector be the one to decide how to allocate its scarce resources. The private sector today is extremely burdened by taxes and regulations, and thus is not able to adjust easily to trade-induced dislocations. Let's fix the tax and regulation problem before deciding to ban imports and immigrants. As for immigrants, I think it's extremely important that immigrants understand that they must assimilate; they must work (we have too many handout programs that are being abused and should be eliminated); that they must adopt Western culture and mores; and that, for example, Sharia law is incompatible with Western Civilization. We should be open to immigration, but immigrants should be obligated to adapt to and adopt our long-standing culture. I like these 'panics'. It gave me the opportunity to add to my domestic equity positions. The recent adds are already in the green. As Warren Buffett says, 'be greedy when others are fearful'. Thank you, Brexit. I 100% agree only a free enterprise, work and property rights culture will thrive. Why we tax productive behavior (working) or zone property is beyond me. In the United States push-cart vending is routinely criminalized. If we are going to subsidize anything perhaps we should subsidize working. No taxes whatsoever on the first $20,000 of work income, annually. The FTSE Index (UK stocks) was the best performing major market index in the world today. Last week it was up nearly 2 1/2%. This week it is up another 3% so far. If one listened to markets instead of politicians, one would think that some very good development had occurred there! Caveat: while the FTSEs gains are comforting, they have been more than offset by the pound's loss. True enough about the Pound smash. I still think sovereignty will bring more prosperity than unelected foreign bureaucrats that can't be voted out of power. This is old news now, but this hour long movie lays out the moral and economic case for Brexit. Its very well done. Covers trade, and politics, and culture. Spends almost no time on the immigration controversy, and contains absolutely zero xenophobia. I think its incredibly persuasive and sensible. Makes the case with facts and reason. Its definitely worth watching, even if you see only the first few minutes. I bet you won't want to stop. Have you seen any studies that show that the EU has actually improved the economies of the member states vs what they would have been without it? Has the EU really been a good structure? Your graph of US vs Eurozone equities show that for at least the last seven years the US has outpaced Eurozone. I'm thinking that the EU has been a flop and GB leaving it will be good for them. Everything I've seen on the EU/Eurozone says that the EU has made things worse for the Eurozone. Too many rules and regulations, too much bureaucracy, etc. So UK leaving will be good for the UK. It may well be good for the Eurozone as well, if the UK departure encourages other countries to exit as well. Gold Miners and long Treasury bonds are surging to new highs again today.